The House of Your Dream is an international collection of prose poetry drawn from over thirty years of prose poetry publications by White Pine Press. The anthology is unique in its diversity and includes voices from Europe, Asia, South America, and the U.S. including: Nin Andrews, Robert Bly, Ales Debeljak, Russell Edson, Marie Harris, Juan Ramon Jimenez, Peter Johnson, Kim Kwang Kyu, Morton Marcus, Gabriela Mistral, Pablo Neruda, Naomi Shihab Nye, Charles Simic, Tomas Transtromer, James Wright, and many others. 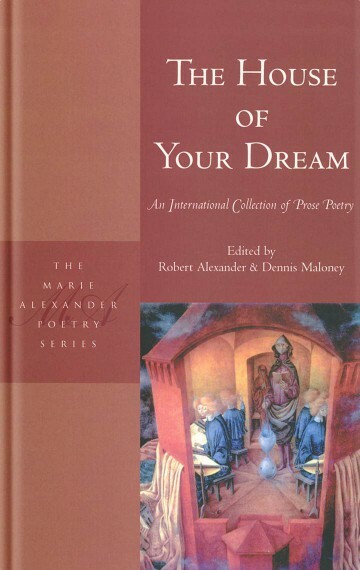 Dennis Maloney is the founding publisher and editor of White Pine Press, and Robert Alexander edits the Marie Alexander Poetry Series, available from White Pine Press, which focuses on single-author collections of prose poems. “White Pine Press has published some of the best 20th-century poets–both foreign and domestic–for nearly 40 years. Tomas Tranströmer, Antonio Machado, Pablo Neruda, James Wright, Miguel Hernandez–these are only the tip of the tip of the White Pine iceberg. This is no small feat considering that Maloney and White Pine, much like Hamill (now Wiegers) and Copper Canyon, have managed to survive from revenues generated by hawking their poetry-only wares. As its title suggests, this is a collection of that most enigmatic of poetic traditions, the prose poem. This collection represents Maloney’s history as both a publisher and editor, seeing as its roster of prose poets consists only of those whose poems have appeared in White Pine titles. It’s one thing to arrange and edit a good anthology, and quite another when that anthology must rely upon the publishing history of a single editor for its contents. And take it from us, this is an excellent anthology. Here are a few of this collection’s 90 featured writers: Paul Celan, René Char, Russell Edson, Jim Harrison, David Ignatow, Max Jacob, Juan Ramón Jiménez, Larry Levis, Morton Marcus, Gabriela Mistral, Pablo Neruda, Francis Ponge, Yannis Ritsos, Vern Rutsala, Charles Simic, Eva Ström, Tomas Tranströmer, James Wright, Gary Young. Nin Andrews Robert Bly Magda Cârneci Maxine Chernoff Russell Edson Maureen Gibbon Marie Harris Holly Iglesias Juan Ramon Jiménez Peter Johnson Mary A. Koncel Kim Kwang-Kyu Kathleen McGookey Chonggi Mah Morton Marcus Gabriela Mistral Pablo Neruda Naomi Shihab Nye Vern Rutsala Charles Simic Madelon Sprengnether Alison Townsend Tomas Tranströmer James Wright . . . and many others. We anchored in a bay and put ashore in several boats, approaching the settlement by one of the many man-made canals. Red-throated, long-beaked birds hang on the trunks of banyan trees. All manner of shore birds fly and fish in the shallows; some of our number are well-occupied recording their shapes and cries while others busy themselves at the listing of flowers which run from yellows to deep purples and seem to have been cultivated for some purpose we cannot readily discern. Grasses of blue-green hue have been cropped around shallow sandy pits in what appear to be large gaming fields. At intervals, thin sprays of fresh water erupt unbidden from the ground. Enormous white houses of phantasmagoric design, each with a long blue pool shimmering under a delicate opaque structure, occupy every meter of dry land from the verges of the canals to the wide avenues to the raked beaches. We could glimpse no human activity within. There is evidence that the entire population left hurriedly. What rumor? What disastrous news? They must have gone overland. How else to explain the powerful boats abandoned at docks?